Did you ever think to yourself, I wonder if I could replace the "bad" patterns of behavior that are driving me crazy with "new" positive patterns of behavior? I wonder if Alzheimer's caregivers think about patterns of behavior when it comes to caring for someone living with Alzheimer's disease or a related dementia? Did you ever think to yourself, I wonder if I could replace the "bad" patterns with "new and good" patterns of behavior? I did. Some of the patterns are simple -- like asking over and over what day it is. Others are more complex. One reader told us her husband was shaving four times a day and his face was getting "raw". Others pace. The list goes on and on. My mother was evidencing all kinds of patterns of behavior -- doing the same crazy things at the same time of day or night -- over and over. At approximately 9:37 PM, at night, my mother would get up and announce that she needed to start cleaning the house. I am talking every night. Imagine trying to explain to someone living with Alzheimer's disease that it is night time and you don't clean at bed time. I'm not sure how many times I did this, more then I want to remember -- it didn't work. My mother would wake up at approximately 1:29 AM, get out of bed, open up our front door, take a few steps and look around. After a few minutes she would come back in and get in bed. Same thing at 4:29 AM. Each and every time, I would get up out of bed, stand back, and watch her do it. I did not intervene. After a year or so I finally started to understand why she was doing this. After a year or so of reading research about Alzheimer's disease and dementia, I came to a conclusion -- exercise was the single most important variable in caring for someone with Alzheimer's disease. I enrolled my mother in a gym for the first time when she was 87 years old. At first I put her in the class for seniors -- the Silver Sneakers class. It helped. One day when she came out of the class I decided to put her on the treadmill. She resisted, but she did it. Then something started happening that changed our lives. My mother would start walking on the treadmill and at the 6 minute and 30 second mark she would bend over like she was going to fall. She would grab the side rail on the treadmill and more or less hang over it. Her feet would keep moving. At the seven minute mark she would stand back up, straight, and start walking. This happened every time. It amazed me. Patterns of behavior. I came to a conclusion through these observations. First, most Alzheimer's patients have patterns of behavior -- some good, some bad. Second, most people without Alzheimer's have patterns of behavior -- they do the same kinds of things around the same time of day, over and over. Patterns of behavior bring homeostasis into our lives. Having well defined patterns of behavior brings comfort, organization, and a sense of stability into our lives. The fact that we live a life of patterns also helps explain why most of us don't like change. And, why we resist change. I thought to myself, what if I could change my mother's bad patterns of behavior and channel her energy into more positive patterns. I decided to introduce an entirely new set of behaviors and actions into our lives. Over time I introduced one new behavior after another until we reached the point where our day was organized in a way that made each day very similar to the one that came before it. Our day had a very well defined pattern and so did our daily actions and activities. Here is a simple example of how it worked. Instead of waiting for my mother to ask me. "what day is it". Meaning what day of the week. I put the newspaper in front of her each morning and asked her, "what day it is it". Then, what is today's date? She would read this to me from the top of the newspaper. I also bought a great big clock and put it on the wall right in front of her seat where she couldn't miss it. I also asked what time it is? I did this two or three times a day. It cured her repetitive behavior. Over the years I cured my mother of meanness, getting up in the middle of the night, urinary incontinence, and the dreaded bowel movement problem. I did this by introducing new patterns of behavior and news tools into our daily equation. Did it work perfectly -- no. But it works. I wrote previously about most of these issues: meanness, pee, poop, and my own metamorphosis as an Alzheimer's caregiver. You can find all of this information on the blog by reading the articles featured on the sidebar of the blog, or by using the search box. For example, type "how to do it Alzheimer's care" (without the quotes) into the search box. My name is Bob DeMarco. My mother Dorothy lived with Alzheimer's disease. I took care of my mother from November 18, 2003 until May 25, 2012 - 3,112 days. I know how you feel. We lived our life one day at a time. 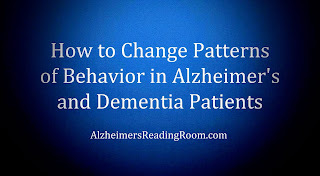 Title: "How to Change Patterns of Behavior in Alzheimer's and Dementia Patients"
The Alzheimer's Reading Room is the number one source of high quality expert information for the entire Alzheimer's and dementia communities.